How It’s New York: The bi-monthly gathering of locally based writers alternates between two Manhattan venues, both Westside: the Thalia Café in Symphony Space on the first Tuesday, and The Cell, on the third Tuesday. How It’s Irish: Participants are either Irish born or of Irish extraction or affiliation–and all were seemingly born talking! Orla O’Sullivan visits the IAWA Salon and found that “words and laughter kept the impending rain away” She also read a part in a play!. 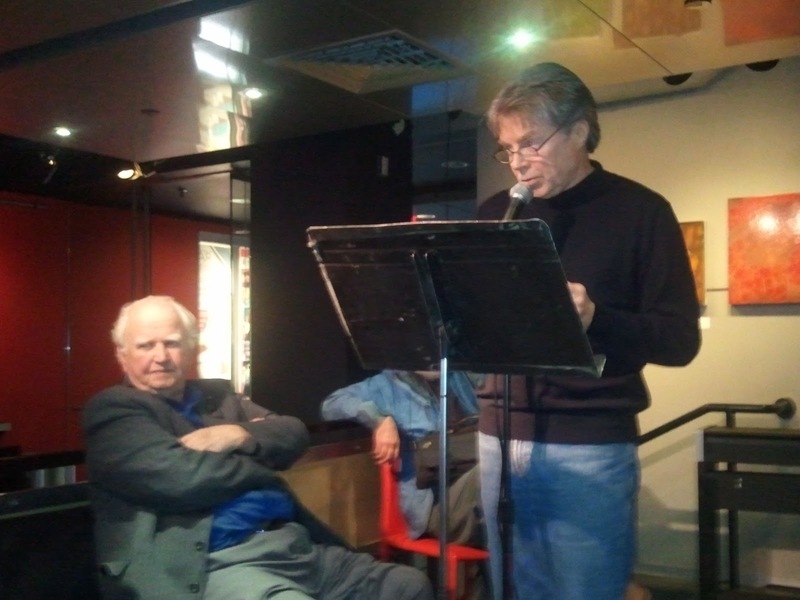 Malachy McCourt invoked the bible to wrap up the Feb. 7 gathering of the Irish American Writers and Artists, its 12th since McCourt came up with the idea of a regular IAWA salon last June. McCourt told those at the reading: “In the beginning, as the bible says, was the Word, but first came the Irish.” About 25 came to the Thalia Café of Symphony Space, the Upper West Side cultural venue, to prove his point. From conversations struck up between strangers over shared food to the topics broached by performers, the Irish showed themselves never stuck for words. So convivial was the gathering that yours truly found herself drafted into reading a part in a friendly stranger’s play (Sheila Walsh). Nine readers between them found words to express the heaviest of emotions: the horrors of their own decrepid bodies, the departures of dying parents and spouses… Lighter, if equally honest, was the character of a husband who used to imagine himself making love not to his beloved but equally old wife, but to Princess Diana. With both women now dead, the 89-year old, rural widower in Tom Phelan’s novel, Nailer, spends his days in the church, “boring God with his sins”. Kathleen is the winner of this year’s Irish-American Crossover Writing Contest. On this Tuesday night, words and laughter kept Wednesday’s impending rain away. More details on this and future events can be found in the blog of organizer Charles Hales. The next Salon will be on February 21 at The Cell Theatre, 338 W23rd Street, beginning at 7PM. For more information on joining the Irish American Writers & Artists you can contact Charles Hale at chashale1@yahoo.com. *Editor’s note: yes, this can mean twice a month OR every other month. In this case, it means twice a month. **Editor’s note: or just affiliated, strongly. Thanks for all the kind words, Gwen. It was a fun evening and Orla added to it with her with her lovely presence and dazzling acting skills. And she writes, too. What a great talent!